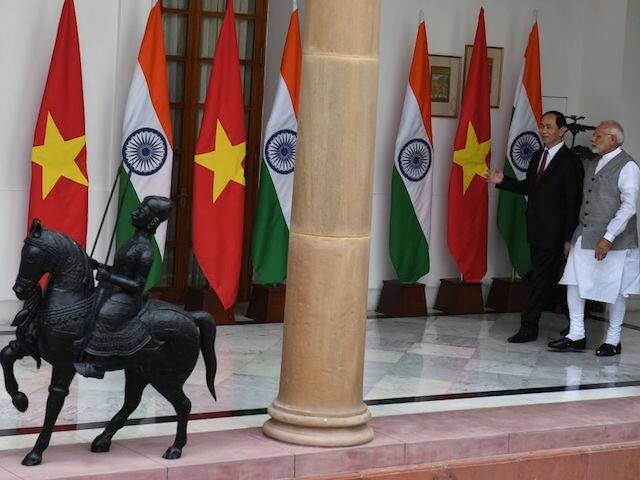 During a state visit by Vietnam’s president Tran Dai Quang to New Delhi on Saturday, Quang and India’s president Narendra Modi reached agreements to increase trade and investment between the two countries and to cooperate in development projects in the defense sector and to boost ties in oil and gas exploration. 27. The two sides re-affirmed their determination and efforts to further cooperate in maintaining peace, stability and development in the Indo-Pacific region as well as in the world at large. They also reiterated the importance of, and the need for complete compliance with international law, notably the United Nations Convention on the Law of the Sea 1982 (UNCLOS), including the implementation of international legal obligations in good faith, the maintenance of freedom of navigation and over-flight in the South China Sea, full respect for diplomatic and legal processes, peaceful settlement of disputes without resorting to the threat or use of force, and in accordance with international law. In this regard, both sides support the full and effective implementation of the Declaration on the Conduct of the Parties in the South China Sea (DOC) and look forward to an early conclusion of an effective and substantive Code of Conduct in the South China Sea. In the past, China has used military force to prevent Vietnamese fishing boats from fishing in their own territorial waters. In the 1990s, India adopted a “Look East” policy, committing the country to actively engage the countries of Southeast Asia in terms of trade, security, and agriculture. Nothing much came out of that policy, and in November 2014, India’s prime minister Narendra Modi announced that the “Look East” policy would be replaced by an “Act East” policy. It is unprecedented, to say the least. It is a coup of sorts: the presence of all 10 Association of Southeast Asian Nations (Asean) leaders as chief guests for India’s Republic Day celebrations in New Delhi. This puts much speculation to rest as to whether all 10 heads of governments would be present on the occasion or not. Notwithstanding some of these countries maintaining close ties with China, all the Asean leaders have decided to be present for today’s India-Asean Commemorative Summit as well as Republic Day tomorrow. This would send out a clear message that Delhi’s Act East policy complements Asean’s Act West one. India’s focus is now on upping the game to be a player in Southeast Asia to balance power dynamics. Amidst palpable euphoria at India hosting the heads of all 10 Asean countries as guests of honor at its Republic Day ceremonial parade, preceded a day earlier by an Asean-India summit celebrating the silver anniversary of their relationship, India needs to shed its abiding image of bureaucratic inertia, of being tardy and slovenly in turning its initiatives into action. China comes across as a Plutus or a Croesus, enticing India’s ring of neighbors. India is perceived more like a poor Lazarus. That India has no deep pockets is understandable; what is inexcusable is its bureaucratic sloth and smugness. While India remains a laggard, in sharp contrast China sprints ahead. India is seen as chugging along, metaphorically, with a bullock-cart mentality; China has zipped ahead like a Formula One racing car. Repeated reports by some Indian media that New Delhi has launched a diplomatic offensive against Beijing are baffling to the Chinese public. 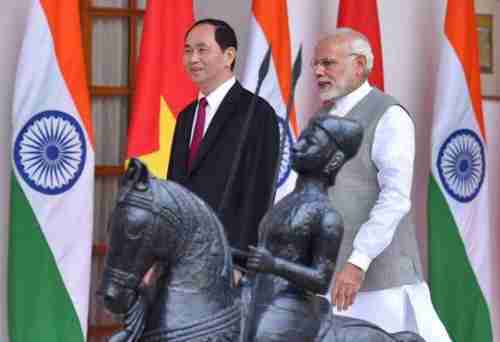 India and ASEAN have the right to hold the summit, which exerts no negative effect upon China. However, some Indians are tenacious in exaggerating the meeting’s implications to China. In fact an examination of the China-Southeast Asia relationship suggests that the situation is not like that the Indian media depicts. ASEAN’s trade volume with China is more than six times that of India, and China’s investment in the region is 10 times that of India. Some members of the Indian elite enjoy engaging in geopolitical bluster. But they cannot truly gauge the reality of India’s comprehensive strength and diplomatic experience. They are beginners playing at geopolitics. Honestly speaking, Chinese people are not occupied by India. New Delhi is not Beijing’s major trading partner, and, despite border disputes, is not an imminent security threat to us Chinese. It actually is somewhat surprising that all ten ASEAN country leaders were willing to attend India’s Republic Day celebrations. Cambodia and Laos are very close partners with China and one can imagine that they asked China’s permission before attending. Other ASEAN countries have varying relations with China and India but, in most cases, China is a more important trading partner.